My story actually starts at the beginning of my life. I was born and raised in a conservative, traditional denomination. In my forties, for reasons known only to God, I stumbled upon a great significant fact. I did not know Him. In my religiosity, I believed I was serving Him quite well in the church, but in reality, I had no relationship with Him, so all my serving was for my own ego. Looking back, I would often say that I thought I was doing God a “big fat favor” (smile). When I “stumbled”, it was quite a “revelation” that I was not really doing anything for God, and I was stunned. In those moments, I fell to my knees and confessed my sins – especially those of arrogance, pride, and rebellion and gave my life to the Lord with all my being. Life then moved me in a direction that desperately tried to keep me from His Biblical truth, so my story is really one of God’s abundant grace, mercy, and faithfulness. Every day I thank Him for putting up with me and loving me so much that He actually stepped in to rescue me from deceptive teachings that I had embraced, which were outside normative Biblical theology. I got involved in two different religious movements over a period of about nine years, however; I will focus my testimony at this time on Messianic Judaism’s Hebrew Roots [HR]. Disclaimer: This writing is a perception of what I have observed and witnessed in the Hebrew Roots movement as I experienced it. Those within this movement may have differing perceptions and experiences; therefore, not everything I came to believe may or may not be what others have accepted as truth. I continue to affiliate with the movement, although not in practice, but observe similar teachings, doctrines, and traditions which encompass all of Hebrew Roots [HR] from one extreme to the other. My impressions, as recorded here, are my story during that time – but no longer what I currently believe. It is my intent in this writing to present how the movement entrapped me, how I came to see the Truth of God’s Word, how the HR movement has redefined Biblical facts and employed inaccurate information, and why I walked away from the Hebrew Roots Movement. For those who are involved in HR/Messianicism and believe it to be the greater truth compared to the church/Christianity, I pray that you take a second look at the system you have incorporated into your life and please do some extensive research for yourself. This movement is based on errant concepts designed to entrap you in a false system that is contrary to the New Covenant, purchased and redeemed in the blood of Messiah, and His finished work on the cross. There is no intent on my part to appear anti-Semitic. I love the Jewish people and respect them. This writing is not aimed at denouncing Judaism. It is what it is, yet it would be important to understand that Judaism has nothing to do with the New Testament or belief in Jesus/Yeshua. My only perceived “agenda” when speaking of Judaism, is to expose the error in blending the two systems. I have had many personal contacts with Jewish people the past few years. They have taught me much about “true” Judaism and how they perceive the Messianic Hebrew Roots movement, which is an offense to them. With Paul, “I have great heaviness and continual sorrow in my heart”, as I pray daily that the Jewish people and others, no matter what their ethnicity, will come to know Jesus Christ as Lord and the true Messiah. The numerical indications throughout my testimony match links and comments given in the footnotes for further information, study, and clarification. I welcome your comments, questions, and perspectives. Please contact me at my email address found at the end of my testimony. Thank you! It was a very cold winter day in 2000 when I slowly walked into the church through the side door. My heart was thumping loudly and those pesky butterflies were fluttering, searching for landing space. It was my birthday, and I believed it was a “sign” that I was being “reborn” into a “new life” spiritually. I felt my search for Jewish converts would help me understand the Bible in a deeper and more meaningful way [due to an errant teaching I had heard years before in the faith movement: the New Testament was originally written in Hebrew] and therefore a Jewish perspective was critical to know and obey God. This was my sole reason for attending a Messianic congregation [some come into HR because of an impression that they must keep the 7th day Sabbath, and other mystic experiences – often by “special revelations”]. I was excited, but anxiously looked around the church vestibule, not sure where I was supposed to go. A nice looking guy came up to me straight away, smiling, and welcomed me with a friendly easy going style. I liked him immediately. He had on a Jewish kippah [skull cap or “beanie”] and fringes [tzitzit] hanging from the belt loops of his pants, something I was not familiar with [these are traditional Judaism practices]. It certainly roused my curiosity, as I followed him to the section where the Shabbat [seventh day/Saturday] service was usually held in the church basement. The chairs were all set up and a few people mingled here and there. My “host” introduced me around to the others. Everyone was quite open and welcomed me with, “Shabbat Shalom”[Sabbath Peace]. I eventually found a seat, thankful just to sit down and observe. It was my very first Sabbath “schul” [service] and my first association with “Messianics”. These are not necessarily Jewish converts to Messiah. It is my opinion, based on what I have observed in the movement for several years now, that better than 95% in this movement are “Gentile Christians” who have left the church and are seeking to find their Hebraic/Jewish Roots by study and practice [in various levels] of the Mosaic Law [Torah]. I noticed a “Holy Ark” [special wooden, engraved cabinet] that contained the Torah scroll [the first five books of the OT] on a stand near the front. The ornately carved “Ark” was covered with Jewish symbols and a deep blue velvet sheath held the Scroll itself for protection. A magen David [star of David] in gold thread was sewn into the front of the velvet sheath along with the usual imagery of the Decalogue written on the stone tablets with Hebraic writing engraved on it. Several Jewish and Messianic themed posters were temporarily tacked up here and there around the room, which covered up “Christian” drawings and graphics. Many of the men had on an Israeli tallit [prayer shawl], tzitzit [fringes] hanging from their belt loops and wore kippahs. Most of them had beards, some flowing like one would picture an OT prophet and others a more neatly trimmed one. I believe the motive was to appear Jewish. A good share of the women had head coverings in various styles and colors – scarves, shawls, or hats – some had Jewish symbols on them. A strange looking instrument setting on the podium, that resembled an animal’s horn, grabbed my attention. It was a shofar – made in Israel from a ram’s horn. Many Messianics own them, which are blown at various points in the service and for celebrating the feasts. I jumped a bit when it was blown – the loud sound surprised me. It was not a pleasant sound, but others seemed quite enthralled with it. At some point I grew to endure it, but it always remained a very strange discordant sound to my ears [maybe it was just inept “skill” (smile)] Shofar blowing is respected as being truly “Jewish” and going back to one’s Hebraic Roots. Behind the seats were tables lined with white paper that would handle the oneg [kosher “potluck”] after the worship service. There were piles of food spread out after the service – all of it required to consist of kosher ingredients by Judaism [Rabbinical] standards. I had called the office earlier in the week and had gotten a few details which helped enormously. This was a huge step for me as I really had no clue how it would affect my life from then on. I was entering a “fringe” movement known as Messianic Hebrew Roots [HR]. This first visit to a HR Messianic congregation was deeply emotional for me. I was inundated with information overload [a common tactic in HR]. I had no clue what I was getting into [I would compare it to a frog in a pot of water enjoying the warmer and warmer water, unaware that its life would soon be ended as the water came to a boil]. The awe, honor and fear that they had of God captured my attention – something I felt was missing from my last association in Christianity. I was also quite astonished at the beauty of the service and how reverent everyone was. To add to my comfort, many there also carried the same Complete Jewish Bible I had. If one could label a Bible as the standard among its users in this venue, it would be the CJB. As most in the movement believe, this version was giving them a true Hebraic mindset. However; that is a false assumption – this version is a poor one and not really a true representation of Hebrew in either translation or use [some of the words are Yiddish which is not true Hebrew, while some words are used and applied as found in the Talmud. These comparisons are based on personal study]. I was impressed at the emphasis on the Old Testament; something I also felt was not stressed enough in Christianity. Sadly, contradictive to that, I did not discern the minor role the NT takes in HR, as more and more refer to the NT as “just commentary” on the OT, throw out passages and verses if they “don’t agree with Torah”, delete books, diss Paul or twist his words to reflect a theological “Hebraic Roots mindset” bent. Again, all of these “antics” were personally witnessed over several years of observing HR on the peripheral. When we stood up to say the “Shema” [Deuteronomy 6:4-9], we faced east, towards Jerusalem [Rabbinic tradition]. I observed many with tears streaming down their faces. Perhaps a longing to be in the land of Israel? Or maybe a yearning to be united with the Jewish people, as most considered themselves to be “lost Jews”? I am not sure. The purpose of facing Jerusalem seems to be more mystical, and definitely not based on Scripture. So much for the “teachers” of Hebrew in this venue [smile]. This is basic Hebrew stuff. I think anyone would agree that if they promote an errant Hebraic Name for God, then their Hebrew knowledge is definitely skewed for everything else they try to teach about Hebrew. A siddur accompanied the service – it’s a Jewish liturgy book which contains OT Scriptures and Rabbinically composed prayers, compiled by Judaism. The prayers and scriptures are written in English with transliterated Hebrew, which makes it easy to recite in Hebrew. A Jewish siddur contains no reference to Jesus Christ as Messiah, however; there are a number of Messianic Siddurim used by many HR congregations that have added references to Yeshua in the existing text. I was dismayed that there were so few references to Yeshua in the siddur; included almost as an “after thought” to make it appear Messianic. When I look back at HR, a similar pattern emerged: Torah is esteemed above everything else, including the Gospel and Messiah Himself. Some had gone so far as to say that Yeshua is Torah manifested in the flesh – based on John 1. This interpretation would definitely have to be forced into the text, as the word used in the Greek is “logos” [G3056 – word] in that passage, not “nomos” [G3551 – law]. As someone pointed out: if Yeshua is Torah, then Torah died for our sins? (smile). When it was time to read the Torah, a prayer was said before and after each portion of Scripture and read in Hebrew or English. Hebrew was preferred of course, but not many men could speak it. These prayers are from the Talmud, which denies Jesus Christ. The men took turns every week reading this portion of the Tanakh [OT], called the parasha [more on this later]. The service ended with one of the leaders putting a large tallit over his head and arms like a tent, and extending his hands over the congregation. In his fingers were clasped the fringes of the tallit. His fingers were also in an odd formation, sort of like a “V” for peace, but all the fingers were used with a split, not just the forefinger and middle finger alone. It all appeared somewhat mystical to me, but I thought it was cool anyway. I was ignorant that the finger formation is a kabbalah custom, although I don’t think the leadership of that particular congregation was aware of it (1). He recited Numbers 6:24-26 in Hebrew which is the normative blessing over people that practice Judaism – another Rabbinic tradition that has been incepted into Messianic circles. I also found that the “Aaronic Blessing” as it is known, is instructed in Torah for only those of the Levitical bloodline to bless over the B’nai Israel [sons or nation of Israel]. I wonder why Messianics feel they can “steal the thunder” from the bloodline of Aaron (smile). Would this really be considered Torah obedience? Overall, the service had beauty to it from my perspective at that time. A lot of the music was Hebraic in style and composition and many of the words were in Hebrew – I grew to enjoy the songs, yet I found it a bit humorous, in a nice way, for as much as the church was dissed for their error, some of the songs were actually Christian songs with the Name of Jesus changed to Yeshua. It puzzled me that they would use Christian music, to be honest, but I never enquired about it then. The service overall was an emotional high and I felt as if I had “come home” for the first time in years. After the “oneg” a Torah study followed, opening up a world that challenged me in regard to “study” outside a Christian one. The Jewish parasha [Talmudic/Rabbinically designated yearly Torah and Tanakh reading cycle] was studied each Shabbat. A portion of the Torah, a passage(s) from the prophets and selected writings [like Psalms or Proverbs] are discussed in light of Torah, called a midrash [from PaRDeS which is kabbalah – explained later]. Because this was a Messianic congregation, a reading and midrash from the Brit Chadashah [NT] was also included. I could hardly grasp the wonder and newness of what I was learning. I attended my first yesod class with new hope surging through my heart that I had found my Jewish connection. However; I discovered that there were no Jewish people in that congregation [many HR congregations do have true Jewish converts, but there are very few over all]. Several people were “hopeful”, having shaken the family tree to see if a Jewish relative would fall out (smile). I found out as the weeks went by, that all were former Christians, just like me – including the leadership. That yearning to be Jewish wove its way into every segment and venue of “Messianic” that I bumped into. The Hebrew language and Rabbinical practices [errantly perceived as first century Judaism] were incorporated as the end-all of “truth” and purpose. Hebraic sounding names were critical to feel Jewish. Many leaders had changed their names, but were not open about it, inferring that they were Jewish and had years of Hebraic study [self study with a Strong’s and a Hebrew lexicon was not implied, but rather that they had “real scholarship”]. Unfortunately their “translating work” is mostly absurd because they are not aware of how Hebrew is correctly translated as noted earlier. I discovered this much later. How sad that these “anointed” leaders feel led to teach what they do not know. They are leading many into a delusional and twisted view of God’s Word. It was at the yesod class that I was told Yeshua was coming for a Torah observant bride – keepers of “all” the laws of God, which meant the Mosaic Law. Because the church had missed this important information, Christians would not have the elevated position in Heaven as Torah observers or at the very worst, not there at all because they were not being obedient to God – some actually teach this. Christians would learn Torah during the millennial reign when the sacrificial system would be re-implemented and the third Temple built under the supervision of the High Priest/Yeshua. Christians would be considered “least in the kingdom” [according to Matt 5:19] because they were not “rehearsing/keeping/teaching” the feasts and Torah as commanded. It scares me now, that I actually believed these false teachings. By the grace of God I did not fall away like so many others, rejecting Jesus, His finished work on the cross, and converting to Judaism, which is major fallout from this movement. That first yesod class broke my heart. I truly believed that I “had missed it”. I completely fell apart in the car on the way home, weeping non-stop for two days in repentance for the “error” that I had been taught my whole life in “church/babylon”. I totally believed I had found the “truth” I had been searching for. I was elated, but very misled, as I immersed myself in a new life style and new theology which systematically worked against me. It eventually became a burden and a yoke that I could not bear. I was absorbing another Gospel and it weighed so heavily on me that I could physically feel it. I did not comprehend then why there was an underlying feeling of weariness and oppression that I could not shake. It puzzled me and I often prayed for the peace of Yeshua to heal my heart and show me His Truth …….. All in God’s time (smile). From that night of teaching, I dived in with both feet – it was almost instantaneous. I met a lovely woman at the congregation that I befriended who was physically disabled. She needed my help to get around and I needed her to show me the Hebraic “truth”. She was well grounded in Hebraic terms, understandings, and practices and we became very close friends. I was also a very quick study (smile). I spent nearly a year in my new congregational “home”, celebrating all the feasts and studying a proper halacha [daily life walk in Torah observance – most of it Rabbinical]. I learned so much and was fitting in quite well. It had been years since I actually felt comfortable and accepted in a religious setting. I was extremely pleased with my new life and my new friends at that point. Unfortunately, as sometimes happens, all “good things” come to an end and a problem arose with the leadership. There was a specific disagreement over how one should observe Torah. I did not “make a scene”, but went personally and quietly to the leadership with my concerns. They took it to the congregation without warning, and I suffered verbal abuse publically. There was no hint that the leadership would react in such a hurtful way. It was a very traumatic experience for me. I was told if I did not like how they did things, I could “hit the road” [in writing]. I did. Unfortunately, my friend did not see things the way I did and we ended our friendship abruptly. It was painful to say good-bye to someone who had given me a fresh perspective on my new lifestyle. I had contact with her much later after I walked away from HR, and wanted desperately to show her the problems and false teachings, but sadly she was too dependent on the leaders and too hardened to her perceived “Jewishness”, as happens so often in this movement. She felt that any continued contact was not beneficial for either of us. It’s hard to break off friendships with people that you care so much for, but unfortunately a reoccurring theme in this venue. After I left that congregation, I started a Torah study at my home on Shabbat with a few other people who also broke off from the congregation at the same time for the same reason I had [they contacted me after the fact]. At first it was so sweet. We gathered at 11am, had an oneg, did praise and worship Messianic style, studied Torah, had more food, and studied additional Torah – sometimes until 11pm or later. It was so cool and I loved it so much. But things started to unravel rather quickly due to differences of opinion as to Torah obedience, which is common in HR. Our group folded after about three months because of division and strife between several of the members. Again, more trauma, frustration, and hurt as I was rejected one more time by those I had considered friends and comrades in halacha. Empty handed, I knew no one else who believed as I did to gather with. I turned to the internet and discovered a multitude of HR ministries – it was a “gold mine” of information …… however …… it was their gold mine! I bought some “truth” and purchased tapes, books and videos to learn a proper “Hebraic mind set” instead of my “pagan Greek western Gentile” one. A “free” bonus was “special Hebraic revelations” and “new doctrines”. I gathered everything I could find that was Jewish, and making all that was Jewish part of the NT, which it is not. The “education” I garnered was tarnished and garish. It was all fool’s gold when I discovered they all had lied to me and stolen from me as well. It all reminds me of an old Greek legend [that darn Greek again (smile)]. Perhaps you are familiar with the Trojan Horse? A giant wooden horse, built as a decoy, filled with soldiers was brought into a fortified city as a gift. Upon resting within the gates, the horse was opened and the city was infused with enemy soldiers who overtook her. HR roots is like that Trojan Horse – perceived as a gift, but inside is full of lies and corruption that infuse one’s belief system until one is overtaken spiritually. I almost did a “mikveh” [Hebraic baptism according to HR] in Yahshuah’s Name [the name I was given to call Jesus]. I was taught that my baptism was in the “wrong name” which made me unsaved (smile). Although HR replaces Christian baptism with mikveh, they are different procedures. Baptism requires a pastor or leader to submerge one backwards under the water [usually up to waist deep] and raise them up out of the water. Mikveh requires a deep [a little over chest deep] fresh water source in which one is completely naked and alone. A sauna, whirlpool and swimming pool are not considered “kosher”, but only a Rabbinically defined and built mikveh pool. One must be physically clean before one does a mikveh and must shower with soap and water beforehand. All jewelry must be taken off and the hair combed to prevent knots that would keep one from total immersion – every part of the body must be completely wet. One enters the water in a forward motion, submerging into the water and then floating without touching any part of the mikveh pool for a few moments. This is repeated two or three times depending on tradition. A prayer is offered before immersion, in most cases. It is a mystic experience and not a “baptism” as an outward expression from sin and into Messiah. It is a ritual process to purify one’s self from uncleanness [tamei]. This does not refer to a sinful condition, but Talmudically defined impurity – like a woman’s monthly cycle [niddah] for instance. A donation or paid membership is usually required in order to use the mikveh (4). The purification system of the OT Temple is not rendered as a “mikveh” – although Judaism teaches this. Mikveh, in the OT text, is used only as a body of water. It appears to be a Rabbinic addition [middle ages]. Picture a HR “mikveh” done in the shallow end of a swimming pool, baptized Christian style, while clothed in some way (smile). A Torah scroll, sheathed in beautiful deep blue velvet, trimmed with gold rick-rack and an imprinted golden star of David on the front, was prominently displayed in my living room to emphasize my new religious affiliation. It was a sign to all who came that Christianity was erased from my life, or so I thought. To my horror, I later found that this scroll was a photocopy and not considered kosher by Jewish people. It is an abomination to them, and I immediately dumped it in the trash, even though I had paid a considerable price for it. It would be interesting to note how many Torah scrolls used in Messianic congregations are the “real deal” [copied in pen in Hebrew letters by a trained sofer (scribe) on special parchment, treated with a unique substance to render it valid (kosher), dedicated with singing and dancing. True Torah Scrolls are very costly – thousands of dollars] (4). I had my own tallit and was slowly learning the Rabbinical prayers for putting it on and off. A prominent teaching in HR is that Jesus wore a tallit, so I believed I was following Him and being obedient. However, the tallit was not developed until the middle ages as referred to in the Talmud. Also, the knot tying, symbolizing the 613 commandments, and stripes which are on most tallitot, are based in gematria [kabbalah]. Along the way, I ran into a Messianic “Rabbi” who had draped his dog with a tallit, and the tallit was dragging on the ground. He took a picture of it, and posted it on the internet. I thought it was cute and quite humorous. I then discovered that this was an offense to the Jewish people because the tallit is considered a holy garment and would not be touching the ground. Someone must have informed the man of his error and he took the photo down for awhile. I could not believe my eyes when I saw it back up after a couple of months. It was quite a shock to think that those who consider themselves so Jewish, have such little regard for the very ones they are trying to provoke to “jealousy”. I began studying Hebrew, and incorporating as many Hebrew words as I could into my thinking so I could be more Jewish – this was most important to me. I was taught that Hebrew was “the pure, holy” language that we would speak in Heaven and if I learned it here, it would save time when I got there (smile). I don’t know where that teaching from, but it’s a pretty common one in HR. As with all the other “special revelations” in HR, I found that it is baseless – Hebrew was not even a language until about 900BCE. The Tanakh [OT] contains Greek, Latin, Egyptian, Persian [Chaldean] and Aramaic loan words. Parts of the Tanakh were written in Aramaic as well. The early language of the Tanakh, before Hebrew was developed around 900-1000BCE, was probably Akkadian or prototype-Canaanite from which all languages are birthed. An interesting note is that Greek was originally written from right to left, as Hebrew still is today. It is a myth to represent the Tanakh as a 100% pure Hebraic/Semitic document (6). Note: TaNaKh is an acronym for: (T)Torah – the first five books of the OT; (N) Nevi’im [Prophets]; and (K) Ketuvim [Writings – like Psalms, Proverbs, and other books]. It is also a popular saying in HR that “A Jew would eat swine’s flesh before he would speak Greek”. I never did find a source for it, although many teachers use it to promote a Semitic NT and Hebrew as the pure original language of the Tanakh [false]. However, the Talmud states that the only other language besides Hebrew that a Torah scroll could be written in and considered kosher, is Greek. There is lot of other proofs that Jewish people not only used Greek, but wrote it extensively in the first century. 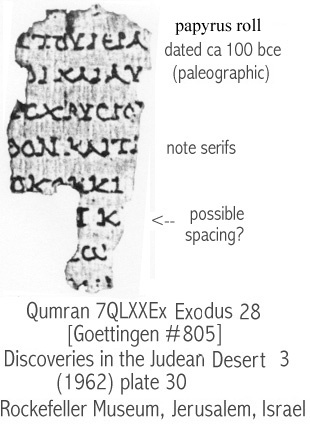 Internal NT textual proof also shows that the disciples and Jesus spoke Greek. Another HR myth busted (smile) (7). Messianic music was a real delight and joy to my ears. There is some really nice stuff out there. I have no complaints with using it, but it becomes a symbol of “brotherhood” with Jewish people, that makes one feel all warm and fuzzy in unity. Judaism is not, cannot be unified with those who believe in Jesus as The Messiah. Davidic dance is quite the wave these days as well, but I believe it is quite overdone. I have read that most Jewish people do not incorporate that much dancing into their lifestyle or religion, and find the emphasis on it in this venue to be humorous if not down right offensive. It bothers me now, that so much importance is placed on a so-called “return to the true ancient Davidic” worship style of the Tanakh [like anyone knows what that really was (smile)], instead of praising and worshipping the Lord in Spirit and in Truth. My car was plastered with home-made bumper stickers in all the windows with “Yahshuah” “Shalom”, “Yahweh”, “YHWH”, “Pray for Jerusalem”, and other Messianic type graphics including loads of stars of David everywhere I could stick them. I even had a personalized license plate that read “TORAH” (smile). I slowly began accepting the idea that the Jesus of the Greek NT was not the Messiah. If Jesus was a Jew, kept Torah, and had Hebrew Name, then what Christians teach is wrong because they do not keep Torah like Jesus did. That makes their Messiah the anti-christ. That may be shock to some who read this, but the concept is flooding HR presently. I shudder when I think of all the times I have heard recently that “Jesus is a greek god” [and much, much worse blasphemy that I cannot write down]; and those who worship and believe in Him are destined for hell. It is sad and perverse stuff. Messianic forums were a place to get tons of ideas on how to better practice my new “Hebraicness”. I was convinced by “personal revelation” that I was from the tribe of Issachar, which fit well into my Two House adherence [Two House Refutation article will be added to my blog under “Pages” and the link posted here]. Others also received this kind of revelation to confirm their tribal connection, making them true “lost” Ephramites [also known as the House of Israel – all ten tribes of the northern kingdom]. I read Messianic books and started studying Judaism practices so I could live more Jewishly even though I was a gentile, and kept Torah, thereby believing that I was provoking the Jews to jealously [this gentile practice actually just plain provokes the Jewish people]. I utterly and truly believed that God preferred Jews over anyone else. After all, we gentiles were grafted into Israel,“God’s holy nation” aka the “Commonwealth of Israel” [false teaching – we are actually grafted into Christ]. I wanted to be a Jew. I was so bummed that I could not claim “real Jewish blood”. It depressed me totally, until I discovered Two House/Ephramite/House of Israel doctrine [completely false teaching straight out of British Israelism that also teaches the whole “lost tribe” canard]. BINGO! Now I was really a hidden Jew from a “lost” tribe! I was a full Israelite in every sense of the word! In reality; I was a mess and my theology was totally skewed. I was also extremely miserable. In my deepest heart, I wanted nothing more than to be obedient to God, for I love Him with all my heart, soul, mind and strength. I was distressed for all the teachings I had studied, including Torah itself – I could not keep the Law no matter how hard I tried. Nothing I did was right and it frustrated me. I became weary and agitated. I prayed constantly that God would lead me to HIS truth and that He would find a way for me to be as obedient as I desired; and as I thought His Word instructed us. Daily, my mind was in conflict with the soothing words from others to whom I expressed my concern on the forums that I belonged to. They told me that I was slowly learning how to keep Torah and God would honor that, because in my heart I loved Torah. They told me that the Ruach HaKodesh [Holy Spirit] would teach me how to keep the parts of Torah that I could. But it was a puzzle as to why He would tell people different ways to keep those parts. God had said to obey ALL of them “as written”, so why would “His Spirit” give a confused message of differing options? It’s only possible to keep about 40% or about 240 of the 613 commands of Torah today. Supposedly, this is considered obedience to “all” of God’s commandments [shaking head]. Their “advice” only angered me. They did not understand. God said that Torah was to be kept as written, not what you “could” do. He called what we were all doing as “what is right in your own eyes”! I could not keep it at all. I completely failed. So I turned to kabbalah – it seemed quite pure to me and a way to learn how to truly understand the depths of Scripture and thereby, learn God’s truth about keeping Torah. I also knew that within its tenants I could achieve a deeper relationship [levels of knowledge] with Yahweh and that really had me cranked up. I was studying a “Messiah” book by a Messianic “Rabbi” who taught kabbalah Messianic style. kabbalah, as practiced in some factions of Judaism, does not refer to Yeshua as part of the Sefirotic Tree [the ten emanations of God]. The book I was reading taught the Zohar/kabbalisic concepts, but placing Yeshua as the middle pillar and as Metatron within that whole mystic association. It was then that I discovered PaRDeS was kabbalistic – a system of understanding Scripture by levels: Pasha (simple surface text), Remez (hinted), Drash/Dresh [midrash] (allegorical)], and Sod (esoteric) http://www.betemunah.org/remez.html. One sought to find the sod level above all [the deepest mystic level with “revelations”]. I was geeked, “enlightened and illuminated” – but still …… I had no peace. My elation slowly turned into FEAR – I became dreadfully afraid of “Yahweh”. I had learned that His greatness and majesty was all LIGHT in immense proportions compared to the sun. He was so grand, so infinite, so vast and outside of time and space that He was totally unapproachable, incomprehensible, and distant. I was completely overwhelmed: so puny, totally insignificant, completely unworthy, and in abject darkness. How could I ever pray to Him again or dare to communicate with such an Awesome Being? I wept for days. It almost destroyed me. I did not know what to do. I was confused and depressed, so I set the book down for a time trying to make sense of it all. Incredibly, God intervened abruptly in my life at that point. He sent someone that I listened to, who spoke the truth, presenting me with facts. It was an agonizing process, but given in love and patience, with wisdom from above. Most of all, I was shown that I needed to go back to the Word and study it without my HR blinders on. Many people have asked me the specifics of how I got out. I remember back to those days and the thing that stands out is the way I was shown the truth with facts. First, and probably the most effective information, was the exposure of kabbalah as a mystic occultic system. When I saw the dangers of it and then compared it to “Messianic kabbalah” I could see that I had been terribly misled and lied too. That really started me thinking seriously about what I believed. If the teachers were wrong about this, what else was incorrect? Secondly, I learned that my discerner was “off”. I had accepted all this “truth” from leaders whose fruit was definitely not Gal 5 stuff. Before I even met my “God-send”, I had not received a Bible version that I paid for from one teacher and was lied to by another “Messianic Apostle/Rabbi about product I had returned. In both cases, I was not refunded the money, but was told it was a “donation”. It made me quite uneasy, but I was not strong enough to question it at that time. The actions and behavior of the leaders was often rude, cruel, and judgmental. Their words were filled with anger and hatred for Christians and those who did not believe as they did, or questioned their teachings. I was blind to it. I cheered them on. How sad to be under that kind of spirit and not realize how ungodly it is. Most importantly, I was instructed by my new friend to just read the New Testament without my newly acquired Hebraic mindset. To this day I have never stopped doing that, which includes the OT as well. As I read, I saw that what I had been taught was grossly wrong. The New Covenant is not about a system of laws, it is about the simplicity that is in Christ. 2 Corinthians 11:3 But I fear, lest by any means, as the serpent beguiled Eve through his subtlety, so your minds should be corrupted from the simplicity that is in Christ. I am also a “factnoid freak” which made my new friendship all the more God appointed because I received vast amounts of factual information which showed the error I had incepted as truth was founded on speculation and conjecture. The Semitic primacy of the NT, all the Rabbinical concepts that permeate Messianicism under the umbrella of “oral Torah”, the “Hebraic mindset”, first century Jewish practices, the NT teaches Torah observance canard, etc are all aimed at keeping one under a yoke of delusion and error, etc. The list is very long. I began to do a lot of research, over several months, for myself and found that everything I had accepted as truth was lie upon lie. It was not hard at that point to strip everything off that was remotely Messianic. I think of it as the “domino effect” (smile). Once those initial blinders came off, God began to show me in His Word how wrong I had been. It is not experience or obedience that brings us deeper into relationship with Him. The New Covenant in the blood of Christ gives a fresh perspective in the “Spirit of the Law”. The laws written on the heart are not a list of instructions, but a Holy Spirit inspired “mind set” that convicts us of wrong, gives us wisdom and understanding of God’s Word, the words to speak to others, and the desire to serve God by being Jesus hands and feet to a hurting world both in assistance and in sharing the Gospel. The entire Bible is full of what God expects of us. It is a compilation of things that God wants from us from Genesis to Revelation, not a specific boundary of sterile laws [legalism]. As Jesus explained – we must love God above all, and our neighbor as our self. In doing that, Jesus says we have fulfilled the law. This is reiterated specifically in both the OT and NT. It is about the heart and LOVE. Matthew 22:37 Jesus said to him, You shall love the Lord your God with all your heart, and with all your soul, and with all your mind. 38 This is the first and great commandment. 39 And the second is like to it, You shall love your neighbor as yourself. 40 On these two commandments hang all the law and the prophets. 1 John 3:22 And whatever we ask, we receive of him, because we keep his commandments, and do those things that are pleasing in his sight. 23 And this is his commandment, That we should believe on the name of his Son Jesus Christ, and love one another, as he gave us commandment. 24 And he that keeps his commandments dwells in him, and he in him. And hereby we know that he stays in us, by the Spirit which he has given us. Colossians 3:12 Put on therefore, as the elect of God, holy and beloved, bowels of mercies, kindness, humbleness of mind, meekness, long-suffering; 13 Forbearing one another, and forgiving one another, if any man have a quarrel against any: even as Christ forgave you, so also do you. 14 And above all these things put on charity [love], which is the bond of perfection. Micah 6:6 With which shall I come before the LORD, and bow myself before the high God? shall I come before him with burnt offerings, with calves of a year old? 7 Will the LORD be pleased with thousands of rams, or with ten thousands of rivers of oil? shall I give my firstborn for my transgression, the fruit of my body for the sin of my soul? 8 He has showed you, O man, what is good; and what does the LORD require of you, but to do justly, and to love mercy, and to walk humbly with your God? Deuteronomy 6:5 And you shall love the LORD your God with all your heart, and with all your soul, and with all your might. Leviticus 19:18 … but you shall love your neighbor as yourself: I am the LORD. There were times when I struggled with it all in the early days. I was still receiving emails from all of the HR organizations. I belonged to several Messianic forums where the constant battle of my mind to stay focused rather than what I had been taught and had been pounded into my brain. I had listened to a vast number of audio tapes and read everything I could get my hands on when I was under the HR cloud. Even today, I hear teachings on the net that bludgeon people with “keep Torah”, “keep all the commandments of God”, etc. Where is Jesus, I ask myself??? It settles into your soul, causing fear and anxiety that you are failing God and will be considered least in the Kingdom. This is a form of brainwashing, in my opinion. There is nothing in the entire Bible that points to this kind of “meditating” or understanding of the Word. In my forum posting, I would receive constant attacks about my refusal to go back to Torah. At first when I had those occasional panic attacks, His peace would flood my soul, and instead of weakening, it cemented my resolve. I think that God gave me a hard heart that refused to listen so that I would not fall back, as I see so many doing. Today, when people tell me that I have missed it, am disobedient, lawless, and rebellious, I smile. I remember what it was like to be bound and gagged to a system that imprisoned me. It didn’t take long, once the door was unlocked for me, to taste and see that the Lord is good and that in Him is freedom! My heart sang and rejoiced in the mercy of God! Reading His Word became a greater joy, for within it’s pages is beauty, love, and a deep satisfaction that God desires my heart, my love, my submission for Him to work with daily. It is not a law or a feast that shows my obedience, but that I am one with Him and seek to do His will for the praise of His Glory. His will is not regulations, but freedom as the Spirit leads. We are all unique in Christ and each person has an individual plan to love their neighbor as He wills with the fruit of the Spirit fully working in our lives. A special website I have deep respect for also helped educate me concerning the problems in HR and the leaders who promoted un-Scriptural teachings. It was invaluable. Please understand that is was not easy for me. I was steeped in HR. For many months battle was long and hard and caused me to question myself constantly. Thank God He blessed me with these incredible resources and precious people who stood by me and gently, but firmly and lovingly kept me focused on Jesus, not on a system of belief. One needs to read the Word and allow the Holy Spirit to open the eyes of one’s heart. It’s what I did then, and will continue to do for the rest of my life. My conclusion, after several years of study and research, is that Judaism and Christianity are two separate and distinct religions. I heard someone say that HR could be compared to running a shopping cart down an isle – with Judaism on one side and Christianity on the other, while picking items from each side to form a new religion. It’s a conundrum and an impossible fusion which results in “blender theology” (smile). The most tragic thing about all that I had incepted is that Jesus Christ is a Torah Messiah, not a New Covenant one. By spending every moment of life searching for the Hebraic edge and setting aside the real Gospel of reaching out in Christ’s love to the needy and hopeless with the message of salvation, HR travelers are lost on an “ancient path” that leads to a dead end. It is self-focused, not Christ defined and glorified. I pray that in some way my testimony reaches into your soul and mind enough to search out what I have said. I do not claim to be a teacher. I have presented what I believe is true, based on what I have studied. Please, search out these things for yourself and ask God to clear your mind for His wisdom, and seek after His truth at all costs. 2) There is a dependence on Rabbinical [Talmud] concepts that permeate HR under the guise of “Jewish sages”, our “Jewish Fathers”, or “ancient Jewish writings” which I believe defines the “Hebraic mind set” to a great degree. The yesod class that I took in my early days was based in Rabbinical teachings. I don’t think that Messianics comprehend how much of what they practice is interpretation of Torah based on a system that rejects Jesus Christ. Not kosher (smile). The use of tallits [separate from the use of tzitzit (fringes) alone, which is found in Torah], kippas, magen Davids, the Passover Seder, mikvehs, shekinah glory/presence [kabbalah], bar mitzvehs, smikahs [authority/ordination to be a Rabbi], the concept of teshuvah, the concept of kashrut [kosher], oral Torah, the Sabbath eve service with candles [kabbalah], special prayers [Talmudic], Pirkei Avinu [renamed from Judaism’s Pirkei Avot – meaning Ethics of the Fathers of Judaism/Talmud – Avinu means Our Father – referring to God, but the teachings are Talmudic none-the-less] Hanukkah’s eight day miracle of oil [legend], PaRDeS, the use of HaShem, God or Lord spelled as G-D/L-rd, and tashlich [a Rabbinical custom of throwing bread in a moving river, creek, or stream which is allegorical of casting off sin based on Micah 7:18-20 in which God states that He throws our sins into the depths of the sea – I am not sure how one who perceives themselves to be in Christ would do this when His death already covers all our sins]. These and more are all middle ages Rabbinical additions that are not found in the Bible. Some of these concepts are kabbalistic as well. As a side note – Judaism is a fully Rabbinical religion based in the Talmud. It has zero relationship with the NT and Jesus Christ, because it denies who Jesus is and His Messiahship. [mine looked similar to that one except it had a star of David on the front, only photocopied inside, and was purchased through a Messianic store. 6) The dismissal of the Greek NT, while promoting a Semitic NT, is becoming more and more “popular” in HR This accounts for the number of HR versions that are available to purchase – especially “translated” with a Strong’s Concordance and a Lexicon of one’s choice (smile). Root words are a particular target; twisted, and then forced into the text to mean something they do not. Hebrew is translated contextually, not by redefining words to fit your theological understanding of a verse. It’s really sad how unrecognizable the Word of God has become with all these changes, particularly when the “rule book” [Torah] categorically states God says not to add, subtract, or diminish His Word. I believe the Jewish people have a word for it: chutzpah (smile). Paul’s writings present a real problem in the Greek, so his words are tortured or completely debunked, ridiculed, and dismissed by some. Some have actually ripped his letters out of the NT because they “do not agree with the Tanakh” [OT] or some state that the NT is just “commentary” of the Tanakh. Others refer to Paul as the anti-christ that Jesus warned about. One Messianic “Rabbi” that I know called the book of Hebrews as “inspired as the cat in the hat”. Another well known Messianic “Rabbi” has also put his stamp of approval on the “non-inspiration” of Hebrews. Rewriting Paul’s words, especially Galatians, is common. He seems to be a real thorn in the side of HR because of his denunciation of keeping the Law in Galatians [which some define as being against the “oral law” and then teach from it secretly, anyway (shame!)]. As someone said, “if HR keeps ripping books out of the NT, all that’s left is a pocket sized comic book version of the NT” (shaking head). The attempts to persuade those in HR that the NT has Hebrew/Aramaic primacy are quite persuasive to those unknowledgeable is this area. The premise is that the church interpreted the “real” NT by mistranslating [on purpose] an original Semitic text into Greek that incorrectly appears to support an anti-Torah position. One can deduce by this understanding that the Greek text actually does not support Torah observance – what a concept! (smile). By inserting a Semitic NT [Hebrew/Aramaic], then the “Hebraic mindset” is more apparent and one can truly walk in the “truth” instead of a pagan Greek/gentile mindset that has no understanding of true Biblical principals and has been falsely misleading “Christianity” for the past 2000 years in complete deception and ignorance. The “culprit” is Constantine. He gets so much flak from HR I am surprised he is not rolling over in his grave (smile). Much misinformation is circulating due to Lew White’s Book as previously mentioned. If one does the actual research, one can easily discover that the books included in the canon were already accepted as the “correct” Bible long before Constantine had his council to formally “announce” the canon in 367 CE. Also, the Jews were Hellenized hundreds of years before the first century since Alexander conquered the land of Israel around 300BCE. The NT records problems with Hellenism, so obviously the first century Jews were already “Greek minded”. Perhaps HR should retranslate Paul’s letters stating that he traveled from city to city teaching people Hebrew first so he could then preach in the “Mother tongue” [as some in HR call it – a kabbalistic concept – the Spirit of God is feminine], then they could truly and “Hebraically” understand the “real” Gospel (smile). Unfortunately, Semitic primacy lacks historical documentation. We have Greek fragments from the second century, but none of Hebrew that date back that far. Also, the “church” did not have all the Greek manuscripts. In order to have translated the NT incorrectly or with a “Hellenized mind set” as HR puts it, they would have had to gather over 5,000 manuscripts scattered all over Europe and Asia at that time, which they could not and did not do. Mar 15:34 And at the ninth hour Jesus cried with a loud voice, saying, Eloi, Eloi, lama sabachthani? which is, being interpreted, My God, my God, why have you forsaken me?35 And some of them that stood by, when they heard it, said, Behold, he calls Elias. As a side note, if the people spoke Aramaic, it’s a bit curious that they could not even translate their own tongue that Jesus was referring to God [My God = Eloi] and not Elias [Elijah] (smile). 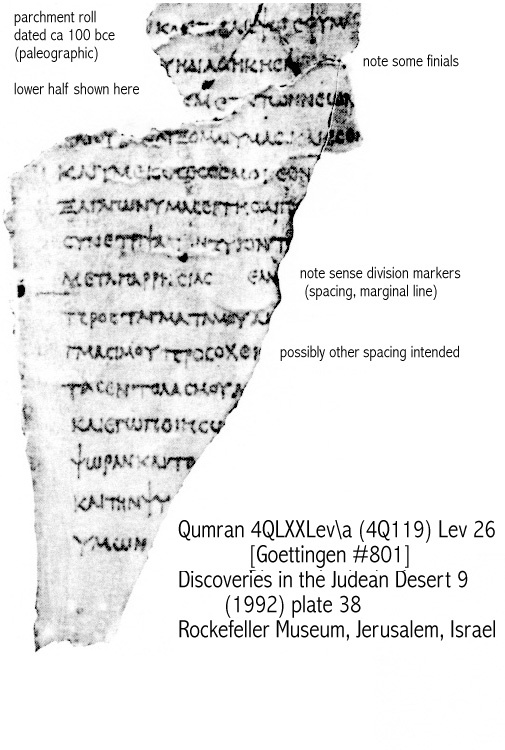 Evidence that Greek was the common language of Israel in the first century is abundant, due to the need to communicate both commercially and with the Romans. Aramaic was probably also spoken, but not the Aramaic of today. The sign on the cross was written in Hebrew, Greek, and Latin. Aramaic was not mentioned. Most Jewish people would have known Hebrew as it was spoken in the Temple and synagogues [synagogue is a Greek word (smile)]. 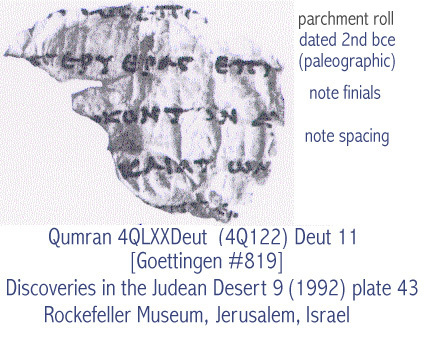 It is also interesting to note that there were Greek writings found at Qumran, and Jewish ossuary boxes [for burial], and coins from the first century found with Greek inscriptions. Jesus spoke Greek in the NT to several people and more than likely to Pilot and Herod. Romans did not speak Hebrew – they considered it a gutter language [barbaric]. John 12:20 And there were certain Greeks among them that came up to worship at the feast: 21 The same came therefore to Philip, which was of Bethsaida of Galilee, and desired him, saying, Sir, we would see Jesus. Mar 7:26 The woman was a Greek, a Syrophenician by nation; and she sought him that he would cast forth the devil out of her daughter. So much information is available to prove a NT Greek origin that I urge those who still hang onto to Semitic NT primacy to please do the research. No copies of original Hebrew exist in spite of those who push it to be fact, including a fallacious “Matthew Hebrew”, and the famous Shem Tov screed [polemic (against Christ) Gospel of Matthew written by Spanish Rabbi Shem Tov (also called Evan Bohan which means “touchstone”) to keep Jews from converting to Catholicism]. The Shem Tov denies the crucifixion of Jesus Christ and His blood atonement, claiming that He was hung [on gallows]. The Toldot Yeshu; a blasphemous writing denigrating Jesus birth, life and death, influenced the writing of the Shem Tov. Yeshu is an acronym which means, “may His Name [Yeshua/Jesus] and memory be blotted out”. Unfortunately, many of the HR Bible versions use the Shem Tov as a base text for their “Brit Chadasha” [NT] “translations” in their blind rush to grasp anything that would confirm a Semitic NT. To conclude, I want to thank you for taking the time to read all the information packed into these pages. I felt it was necessary to paint a large canvas to see the broad spectrum that covers the Hebrew Roots Movement. There is so much information, facts and documentation that I have left out … plus so many stories and funny incidences that happened during my stay in HR. I should write a book (smile). Maybe I will do just that! I ask that you please check with Scripture to define your theology. Please do not let the influence of others, and the desire for an emotionally charged theological need define God’s Word to match yours. As I pointed out earlier, please do the research for yourself.Thessalonians 5:21 Prove all things; hold fast that which is good. 2 Peter 2:1 But there were false prophets also among the people, even as there shall be false teachers among you, who privately shall bring in damnable heresies, even denying the Lord that bought them, and bring on themselves swift destruction. 2 And many shall follow their pernicious ways; by reason of whom the way of truth shall be evil spoken of. 3 And through covetousness shall they with feigned words make merchandise of you: whose judgment now of a long time lingers not, and their damnation slumbers not. 2 Timothy 2:24 And the servant of the Lord must not strive; but be gentle to all men, apt to teach, patient, 25 In meekness instructing those that oppose themselves; if God peradventure will give them repentance to the acknowledging of the truth; 26 And that they may recover themselves out of the snare of the devil, who are taken captive by him at his will. I am willing to clarify all that I have written for those that are truly interested, and answer any questions, so please do not hesitate to contact me. Matthew 18:12 How think you? if a man have an hundred sheep, and one of them be gone astray, does he not leave the ninety and nine, and goes into the mountains, and seeks that which is gone astray? 13 And if so be that he find it, truly I say to you, he rejoices more of that sheep, than of the ninety and nine which went not astray. 1 Timothy 1:19 Holding faith, and a good conscience; which some having put away concerning faith have made shipwreck. Thanx for the nice comments and for visiting, Linda! I am always thrilled to meet former Messianics – it encourages me to know that others are being led out of deception as well! It is indeed a dangerous movement because the emphasis is on the Law and not on Christ. Thanks for your comments – this thing could only occur in the USA!!!! I agree with your comments that is based upon personal experience and facts. I am a Messianic Believer, a child of parents who were holocaust survivors, from Austria/Germany. Most of my other family (Grandparents, uncles/Aunties/cousins, etc) perished. I grew up in the UK within an assimilated Jewish environment and came to faith in my teens over 40 years ago. For me, this was without doubt the most defining event in my life to accept Jesus into my heart as Saviour and Lord. In those days, when a Jewish person became a born-again Christian, the reaction of the church was largely to beat out any semblance of jewish identity that such a person had. This was not an easy thing to deal with. I made Aliya many years ago and served as an Israeli citizen for many years before eventually returning to the UK. I am active in serving the Lord and pursue my Jewish heritage cautiously but enthusiastically. I am fully aware of the excesses of so called Messianics (who are mostly Gentiles not Jews) and also of the dangers of adopting traditions that have their origins in Judaism that are opposed to NT teachings. I believe that Jesus clearly adhered to biblical observances (such as celebrating the biblical feasts) but spoke out radically against the traditions of men; this is a significant difference that some HR may miss. Unfortunately the church throughout history has done the same thing as Rabbinic Judaism by placing wrong emphasis upon traditions of men instead of relationship with the Living God. If we kept Deuteronomy 6v5 and Leviticus 19:18 as the matter of primary importance in our lives, that is only possible to do In Christ, (John 14 verse 6) we would do well. Actually, what I experienced in Hebrew Roots is happening all over the world. Certainly the largest concentration is in the USA, but you can find groups and individuals in most every country. If you look at my cluster map on my home page, you can see that people are visiting from the “four corners of the world” because they have interest in “the ancient paths”. It is a movement that is exploding and infiltrating Christianity. I believe that people are looking for significance in their walk with God and instead of relationship with Him and reading the Word, they are searching for ways to please Him outside of Biblical Christianity. The Way, the Truth, and the Life is in Christ – not in culture or ethnicity or in the old covenant. When you start looking for ways to please God that are in addition to the guidelines set by Christ and the writers of the NT, you are using the traditions of men. You had mentioned that Jesus kept all the Biblical feasts. My question would be – did Jesus offer sacrifices for sin – which was required by God in order to observe them? The church is not indicative of Biblical mandates. If one seeks to follow Christ, it is not necessarily within the walls of an organized religion that we find His truth, but rather in the pages of God’s Word. Keeping His commandments is simple – it is based on His law written on our hearts. You had mentioned Deut 6:5 and Lev 19:18, but the law written on our hearts goes beyond that as Jesus explained – To love God with all your heart, soul, MIND, and strength and to love your neighbor as yourself. Jesus added to love God with all your mind – not in Torah. Lev 19:18 refers to loving your fellow Israelite. In Christ, the new covenant, we are to love all people – Jew and Gentile, Greek and free, believers, and non-believers. Jesus changed Torah to reflect a more inclusive and broadened scope and following HIS Law is of greater worth. I love Gal 5 because it points out what pleases God, and what does not. I find it interesting that Paul does not teach Torah, but the Law of Christ and by walking in the Spirit and exhibiting the fruit of the Spirit, we have fulfilled the all the Law. Awesome! I pray that God continues to open the eyes of your heart continually! Thanks for your words of encouragement! Yes, I too love Galations 5 and also John 14 and 15! Unless we bear His fruit, all the other stuff becomes stagnant or redundant. To be a friend of God (“I no longer call you servants, but friends”) is such an incredibly awesome thing! A servant serves but a friend lays down his life. Many people within the Church of God are satisfied with a servant relationship rather than investing in a deep and close friendship! However, I believe the Lord seeks those who desire Him above all things;who hunger and thirst after Him and discover the glory of knowing Him and the power of His resurrection and the fellowship of His suffering, becoming like Him in His death and to somehow attain to the resurrection of the dead. (As per Paul’s ambition in Philippians ch3 verses 10,11.). Knowing Him in His totality is indeed a noble and glorious pursuit! I can think of no better investment for our lives than this! Hi all, i’m happy to found this site, i was brought a protestant then last year 2000 – 2001 i am in Later Day Saints then i leave LDS in search of truth and found HR messianic movement untill this time but i haven’t visited the congregation last mid 2006 till now, because i felt no different to the pharisee that what i felt inside, more in Torah, and arrogance, hate, judgmental and hypocrisy developed inside of me that was more sinful than before, thought i would become New but it becomes the opposite, I know i’m drawn away from Jesus Christ and his teachings in the New Covenant, I saw this on myself, i dont know if this happened to my fellow members, but the way they talked, they’ve manifested what i’ve become, I thought i found the light but each day have passed it becomes darker and darker until last year i could no longer stand it, then i cried to Him wholeheartedly and confessed my sins to take me out from this darkness, then He does, Jesus Christ/ Yeshua Mashiach is the key what i’m looking for, HalleluYah and Bless us all..
It’s good to know that you have found the truth. May God be glorified! Please be ware that everything you had been taught was built on lies. Do the research and check things out for yourself. The simplicity that is in Christ is the truth. This is an extremely good and TRUE!! I was in HR for 22 months. I began to see things along about month 14, and started researching and paying close attention. I came out and have never been happier. I have gone back to my non-demominational congregation I was going to when I discovered HR. Sadly, and much to my daily grief, my son who is 24 y/o, met and married a girl that is in the congregation and now he is entrenches to the hilt. I pray for him daily that God will open his eyes and he will come out of there. I carry the guilt of being the one responsible for him being there to begin with. Your testimony is great and I hope it helps others. For me, I just want my son back. Since I left the congregation he doesn’t speak to me at all and we work in the same hospital so we see each other quite often. I was also not allowed to go to the extremely extravagant wedding. Again, please pray for my son. Thanx for stopping by, Nancy. I am so happy that you found encouragement through my testimony. I know the heart ache of losing people to the Hebrew Roots movement and like every other cult, it drives a wedge between family members with the thinking that those in it are doing a God a favor by cutting off family. It is so grievous the number of families that have been destroyed due to this movement. My heart goes out to you and I pray with you that your son will come to know the truth. May God open his eyes. I am wondering if you have any comments on the Khabouris Codex, an Aramaic codex dating somewhere between 164 C.E – the first decades of the 3rd century? There is an Aramaic English New Testament based upon the Khabouris Codex and also on on 5 NT books based on the Eastern Original Aramaic NT Peshitta text, published quite recently (2008) by Andrew Gabriel Roth, ISBN 978-1-934916 26-1. Recently I have bought a copy of that translation and have spent considerable time studying it. As one being so well-informed as you seem to be, should I be careful – is it full of HR, or can I consider it “safe” reading? Long time ago i got your permission to translate a testimoney of you and i put it on my weblog. That story went “around”in the netherlands, many read it. I was also bashed for it, i was telling lies etc. My break of with the messianic movement was 1.5 year back. Since then i try to tell the truth about it, and also about HRM. Needless to say they are not happy with me. Since then i could not go back to regurlar chriatianity, i had learned to much, i believe christianity is as wrong as messianism. Both groups went the wrong way. May i use information from your writing above? I am not going to use private info,or to much details. But i want to expose some stuff messianics here in Holland and belgium use in theyre services, songs and dances. And i want to warn people not to fall for it. You can use whatever you want, emje! Thank you for your testimony! I was (and still am) interested in learning the Old Testament in more depth. As part of my quest to learn more, I started studying various HR teachings and then going to various Messianic meetings. While I have learned more about the Old Testament and how it points towards Christ, I have also learned that it is impossible today to keep the Law given through Moses to the Israelites. No one can keep it because there is no temple and no Levitical priesthood serving in Israel. I think one of the greatest protections against false teachings and the falling away of Christians from the church is for the Bible to be taught in church in detail, both old and new testaments, and for all teachings that are false to be removed from the church. Unfortunately, there is truth to some of the criticisms the HR movement throws at the mainstream church. I think the doubt created by the exposition of these false teachings flows over into doubt about true doctrines, and makes the sheep who have not moved on from the milk (and even some who have) extremely vulnerable to being drawn away into false teachings and unhealthy environments. However, God is at work within us, both to will and to work for His good pleasure. (Philippians 2:13) He will give us wisdom if we ask Him to. (James 1:5) As in your case and mine, God is faithful and can bring us to a knowledge of His truth, no matter how deeply we get into a false teaching or multiple false teachings. This is a testimony that should personally speak to all Christians in one form or another. I think almost all Christians either fall into false doctrines at various points or seasons in their walk or currently have some ideas about God or the Bible that aren’t true. We all need deliverance from the false doctrines we have learned. They are all harmful, no matter how small or extensive. The Only safe belief is based upon truth as revealed by God and as testified to by the Holy Spirit dwelling within us. Dear “Sheep”… Thank you for your long article on the HR movement. I knew nothing about the HR movement, but as I read, I recognized instantly what strange things I have come up against recently. Here is how: I inadvertantly bought a copy of Mr. Roth’s Aramaic English interlinear New Testament… and it is pushing an ANTI-CHRIST agenda… which I see in this HR movement you described. I was so disturbed that I set up a blogspot against the Aramaic judaizers to reveal the errors in that volume which cleverly chipped away at the Divinity of CHRIST JESUS Our LORD . That volume is a terrible confusion of propaganda (dare I use the word) against CHRIST JESUS the LORD. It “uses” the New Testament to carry the Netzari doctrines by twisting the words and definitions. I would DEFINITELY WARN other against using this volume. I have writren a very factual review on Amazon about the AENT and have had to stand the attack of the supporters of the Netzari doctrine… very similar to the HR movement, as I just found out. Thank you for your work; it will help keep others out of the darkness. Thank you for your testimony. We left our church a few months ago due to Hebrew Roots creeping in . They continue to proselytize and accuse me of believing half-truths . Some other unethical things have been brought to light as well. So very sad. THank you and praise God that He brought you out of this! Thanx for stopping by! I appreciate your comments and your desire to seek out the truth! The Netzari is part of the Hebrew Roots movement. Just another sect, but all the same none-the-less, especially in regard to a Semitic NT. Andrew Roth is affiliated with James Trimm, who calls himself a Nazarene – which is just more of the same in the HR movement. Mr Trimm promotes the Shem Tov Matthew which he used for his “version” [the HRV] and is just as spurious as the AENT, and denounces Jesus Christ and the New Covenant. Please remove me from your newsletter list. Just as you consider what you call the “HR movement” to be in error, that is how I feel about you and your site. I call what you are doing “the pagan christianity movement” and I don’t want to receive your propaganda. You are totally close minded, and you attempt to lump anybody that calls the Savior by His real name (Yahushua), or keeps the commandments of Yah (ie. the Sabbath) into the same category or belief system. You are the blind leading the blind. I know the scriptures well enough to not follow you into your ditch. If you loved Him, you would guard and keep His commandments, but instead you break them and teach other men to do so. We both know what scripture says about that. I do not, nor have I ever sent out a newsletter. I do not have a “list” and do not mail out any type of information. Guarding and keeping the commandments of Christ is not the Mosaic Law. The commandments of Jesus Christ are to eat and drink of Him, believe on Him for salvation, that He is the Son of God – the Savior, and to love one another. This is the main theme of the NT, not the Mosaic Law. [See John 6 and I John 3]. I do not believe that you keep the Mosaic Law. No one can or ever could. The M Law was given to the nation of Israel, only, to be kept within that community. Every single Law/commandment was to be kept by them. They did not get to shop the list and decide which commandments they would keep and which ones they would “ignore”. This is the false premise on which HR is built – that one only has to keep “what they can”. This is sheer fantasy and not found in the Mosaic Law. The “commandments” of CHRIST are NOT the Mosaic Law, truly spoken! That is why the Mosaic Law and Torah is called the OLD Covenant. According to Jer.31:31 AND 32…the NEW Covenant , which will be written on our hearts, is NOT ACCORDING TO THE OLD COVENANT… which not one of the Law-abiding Pharisees could possibly keep. Why ? Because their human nature had not be born anew from above. They did not know JESUS. When The SAVIOR comes into our hearts, HE+ gives us different commandments to keep: namely, HIS+ WORDS. And, His+ Words are not grievous! Some such are found in Matthew 5, 6, and 7. There are others, such as His+ Words in John 14,15, and 16. Sean, you are not correct to ridicule Sheep. Mr. Sheep has been there , deeply committed, and experienced the difference between HR darkness vs the Light of The LORD. Be wise and read carefully Sheep’s testimony; it will help you. If you seek Y’SHUA+ , HE+ will show you the TRUTH. If not, you will become more entangled with the “which-Torah-Laws-do-we-Keep” movement and move farther and farther into darkness. Be wise, Sean, not re-active. While I agree with Sheep that one cannot follow the law today (no temple for starters) Sean does have a point that paganism seems to have been integrated into the way many Christians worship God, which is something to think and pray about while searching out the scriptures. My guess about the newsletters is that Sean is probably being notified of comments made in response to one of his comments. Is there any way for him to turn that feature off? I don’t use these blogs enough to know. Hi, thank you for sharing this. I have some close friends that have recently fallen in to a Christian ministry that incorporates Hebraic roots but uses a Kabbalistic method of reading the Torah. At first I couldn’t identify it at the time, but I knew there was something wrong. So I asked the Holy Spirit to expose things to me and He showed me things on this christian website that had Sod level of understanding being taught with secrets and revelations, then the tree with roots as the image, then advanced gematria teachings available, Paul was a Gnostic belief, then an image that looked similiar to the Tree of life kabbalah diagram except it was replaced with a human body and Jewish articles and lastly the Holy Spirit lead me to their foundational beliefs about following ‘The Way’ the HaDerech, and that believers must follow the Levitical law of foods that have been sanctified. I had no idea about all these things, but I believe God pointed all these things out and I began to research the findings. Unfortunately, my friends believe they are on the right path because they received a series of revelations by following this method of reading the Torah, like it brought it to life. And the argument was that Jesus spoke in parables, therefore it is ok to study the mysteries and secrets. I realised there was no way of reasoning with this, so I have resulted in prayer for them. I believe that the Holy Spirit led me to your site, because I am now encouraged that there is hope of someone coming out of it. Hopefully it won’t take years. Thank you for sharing your testimony. God bless you.